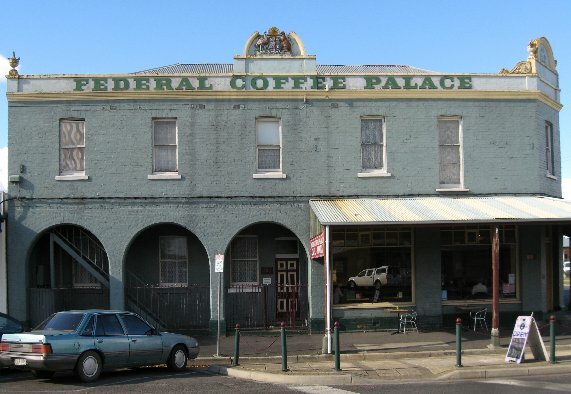 See also: Federal Coffee Palace - a history. 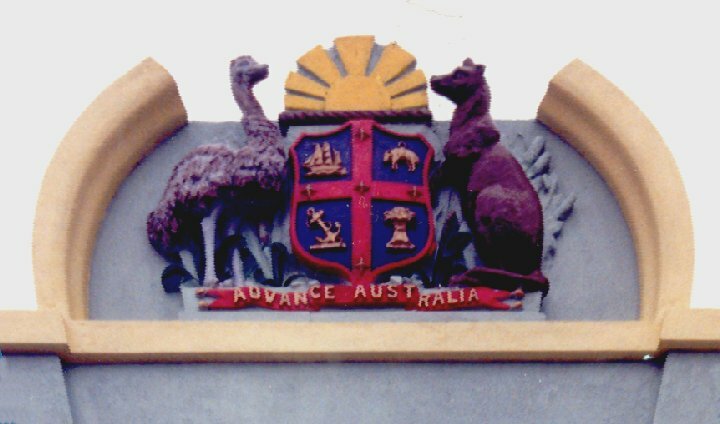 It has been noted and commented that the positions of the kangaroo and the emu on the 'coat of arms' crest on the Federal Coffee Palace are the wrong way around. Firstly, remember (from the history webpage) that this section of the building was completed around 1905 (although there is some thought that it was completed by the the time of Federation in 1901). Prior to Federation, it was not an uncommon practice to place a coat of arms on a prominent commercial or (state) government building, as an expression of pride. However, there was no official design for the coat of arms prior to Federation, and any design could have been created and used. Indeed, it was many years after Federation that an official coat of arms was finally acclaimed. The first coat of arms of the Commonwealth of Australia was granted on 7 May 1908 by King Edward VII, and later replaced by the present coat on 12 September 1912 by King George V. As mentioned, prior to this there was no official crest; the colony of New South Wales had no crest, nor did the Port Phillip district. (Victoria was granted its own crest on 6 June 1910 by King George V). Hence, prior to 1908, a crest could include any animal or insignia, and as it was not official, could be used on any private building without authority, as so many were, but not generally on government buildings. 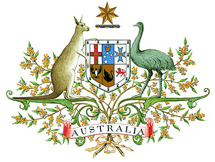 The juxtaposition of the kangaroo and emu could therefore be at the whim of the designer, and thus could not be 'the wrong way around', as there was no right or wrong way prior to he official 1908 coast of arms. Likewise, the insignia within the shield could be any symbol as fancied at the time, but generally represented the diligence of our new country: the sailing ship and anchor, representing the means of our arrival, the sea and our maritime roots; a sheep and sheaf of wheat, representing our land and our future. The colours, also, were unofficial; I could have painted them as I liked, but copied the colours of a similar crest on a building in Adelaide. 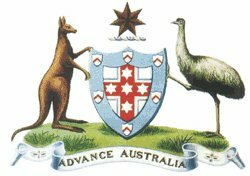 On 7 May 1908, King Edward VII made, by Royal Warrant, the first official grant of a coat of arms to the Commonwealth of Australia. The Arms were composed of a simple shield of white and blue enclosing a cross of St George on which there were five six-pointed white stars, around the outside of which were six small escutcheons, i.e. small shields. The shield was supported by a kangaroo and an emu standing on a grassy mound. Above the shield was the crest containing the seven-pointed gold star of Federation on a wreath of white and blue. The motto 'Advance Australia' was inscribed at the base. The absence of specific references to the states in the shield in the 1908 Arms led to a number of alterations approved on the recommendation of the Commonwealth Government by King George V. The new design included a shield with six parts each containing a representation of the badge of a state, was granted by King George V by Royal Warrant dated 19 September 1912. The positions and poses of the supporters were also changed. The colours of the wreath of the crest were altered to gold and blue. These are the 'livery' or identifying colours of the Arms. The new coat of arms were accompanied by small branches of wattle, ornamental rests for the supporters, and a scroll with the word 'Australia' – none of which are actually mentioned in the 1912 Royal Warrant. Above left, the official 1908 Commonwealth Coast of Arms; above right is the 1912 and current coat of arms.